This Bookreporter.com Special Newsletter spotlights a book that we know people will be talking about this spring. Read more about it, and enter our Spring Preview Contest by Thursday, March 23rd at 11:59am ET for a chance to win one of five copies of THE SECRETS YOU KEEP by Kate White, which is now available. Please note that each contest is only open for 24 hours, so you will need to act quickly! 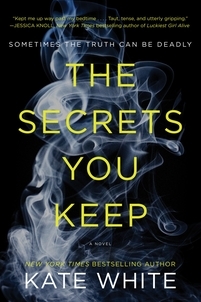 What would you do if you realized that your new husband, a man you adore, is keeping secrets from you --- secrets with terrifying consequences? In the beginning, Bryn’s husband, Guy, couldn’t have been more supportive. But after moving into a new house together, disturbing incidents occur, and Guy grows evasive, secretive. What the hell is going on, she wonders? Then, a woman hired to cater their dinner party is brutally murdered. As Bryn’s world unravels --- and yet another woman in town is slain --- she must summon her old strength to find answers and protect her own life. Her nightmares may in fact hold the key to unlocking the truth and unmasking the murderer. Be sure to read our review of THE SECRETS YOU KEEP in the March 24th Bookreporter.com Weekly Update newsletter. - Click here to visit Kate White's website. - Connect with Kate White on Facebook and Twitter.